The intersection of a complex line in C² containing the origin, with S³ is a circle. This is true for every line passing through the origin whose equation is of the form z2=a*z1 where a is a complex number and z2 and z1 are the coordinates of C². By ‘line’ we mean one-dimensional subspace which we can think of as a plane. Thus there is a circle in S³ for each complex number a (including the case where a is infinite). The sphere S³ is therefore filled with circles, one for each point of S², that is, for each complex number a. (The as fill all of C¹ which we can identify with the Riemann Sphere). As Thurston says “exactly one Hopf circle passes through each point of S³” and “the three-sphere is a two-sphere’s worth of circles”. The Hopf fibration is this map from the unit 3-sphere to the unit 2-sphere. (This is different than stereographic project to R³!). The inverse image of each point on the 2-sphere is a circle. Thus, these images decompose the 3-sphere into a continuous family of circles, and each two distinct circles form a Hopf link. The linking is what makes the fibration a non-trivial fibration. So the Hopf fibration can be thought of as a map from S³ to CP1, or to S². But that is not really a visualization tool at all, it is just a map. To visualize entities embedded in S³ we can stereographically project to R³. I’m not going to summarize how to do that, because it is in a million places on the web, e.g. . 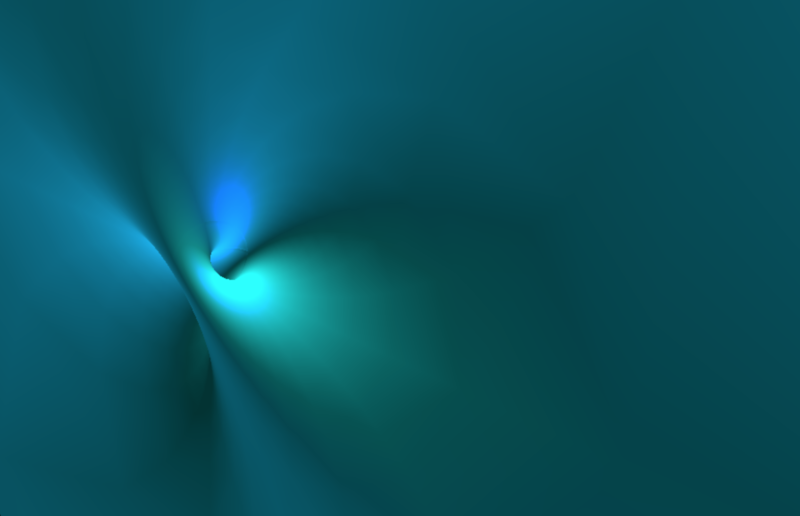 Radial planes in R³ correspond to 2-spheres through N (the north pole, i.e. infinity in R³) in S³. The equator of S³ projects to a sphere , S², of radius 1 centered at the origin of R³. I initially confused Hopf Circles with Great circles and C² with R⁴. Not every two dimensional plane in R⁴ is a one dimensional subspace of C² . Any plane in R⁴ that goes through the origin intersects S³ in a great circle. But Hopf circles are the intersections of complex lines with S³. Note that unlike for S², two great circles need not intersect in S³. I got these formulas from “Sculptures in S3” by Saul Schleimer and Henry Segerman, which is a very interesting paper with many practical (as in fun) applications. A Clifford torus divides the 3-sphere into 2 solid tori. This was hard for me to grasp initially. But if you consider the surface of the donut above (the Clifford torus is a surface), it in-fact divides R³ into 2 solid tori. 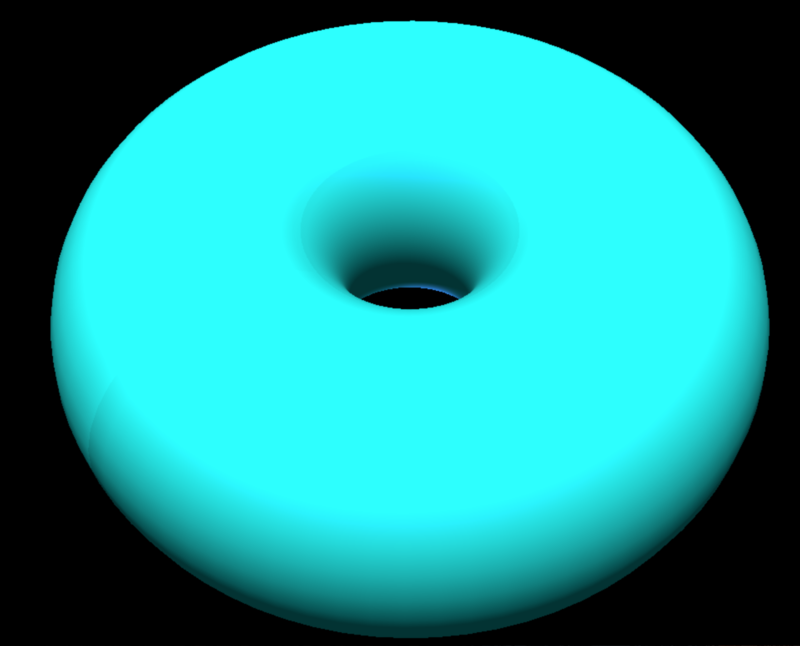 It is clear that the inside of the donut is a solid torus, but the outside is also a solid torus in the pre-image of the projection, i.e. in S³. Perhaps a little sloppy, but that’s the intuition. Inverted (3,11) Torus Knot from Robert Woodley on Vimeo. Trefoil on S3 from Robert Woodley on Vimeo. Trefoil on S3, II. from Robert Woodley on Vimeo. Three-dimensional Geometry and Topology, Volume 1. page 103. Topology, Geometry, and Gauge Fields, Foundations – Gregory Naber, page 17.